Some plants work well together for shape, texture or location and with others it is the colour combination that stands out. This Pholx and Clematis both look exceptional in the late afternoon light. The Phlox adds scent and this vibrant coloured clematis has been in flower since late July. Climbing Roses and Clematis make classic partnerships. Try the dark Clematis jackmanii ‘Superba’ with a light pink Rose ‘New Dawn’. I have seen Clematis montana ‘Rubens’ intertwine with a Golden Ivy and hold its own. 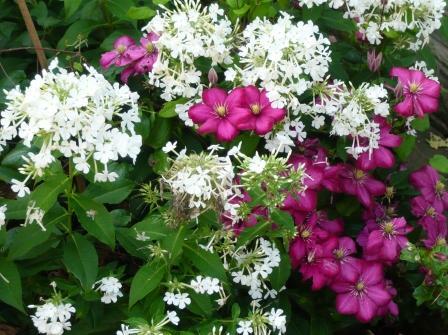 Careful mixing of Clematis varieties can produce good companions. Clematis tangutica’s yellow lantern flowers and seedheads look fine with large hybrids Clematis Mrs N Thompson has a yellow centre to pick-out the yellow lanterns.